Hello friends! 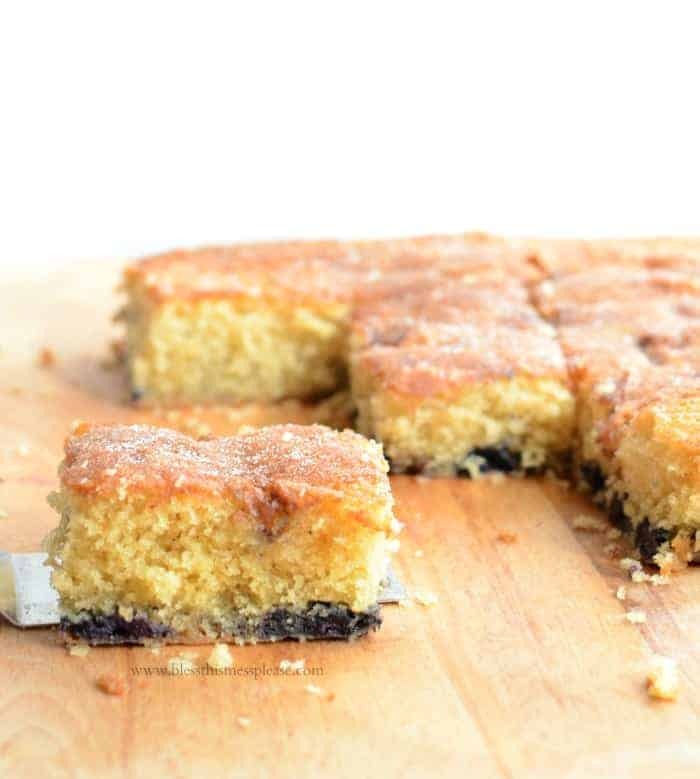 Today’s recipe is for a sweet and tender blueberry coffee cake that comes with a fabulous name – Blueberry Boy Bait. Blueberry Boy Bait first made an appearance in the junior division of a Pillsbury baking contest in 1954. The girl who invented it was only 15 and the recipe won her second place in the contest. She named is for its “habit-forming effect on young men.” How cute is that! They always say the way to a man’s heart is through his stomach and that girl had it all figured out young! A few weeks ago, my friends at America’s Test Kitchen sent me a new cookbook. You all know my love of ATK, so when they asked if I would review a book of all kinds of regional recipes you know “yes” was my only real option. I just can’t get enough America’s Test Kitchen in my life. 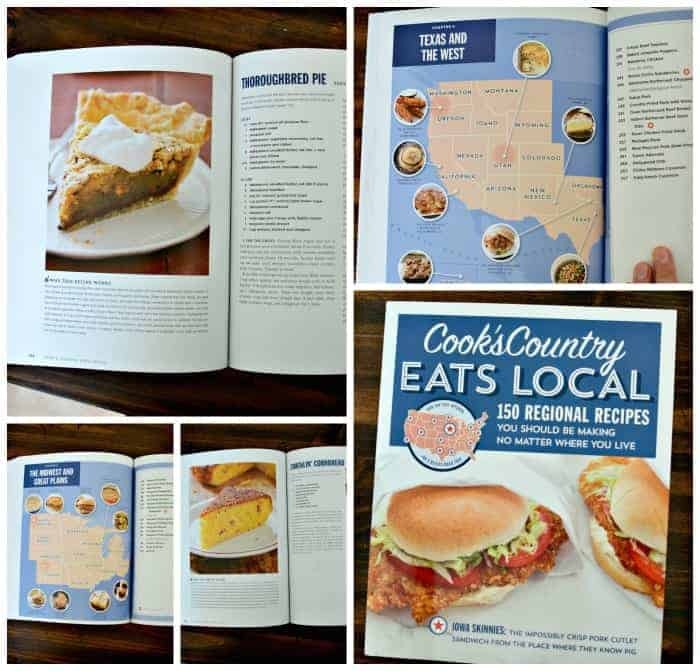 The premise of this book, Cook’s Country Eats Local, is super fun, ATK essentially went on a giant cross-country road trip and found local eats from all across the country. So many countries are known for their food, and America isn’t really one of them, but this book is going to rock that theory. We have such a diverse food heritage and culture here. One of the reasons I love ATK (and Cook’s Country is part of America’s Test Kitchen) is because their books teach you so much about cooking, why a recipe works, and other helpful tricks and tips. This book is no different. Every recipe has two whole pages dedicated to it, including a picture of the finished dish (this visual learner loves that!) and a whole paragraph that explains some of the history of the recipe. The book also includes regional restaurant guides. So. Much. To. LOVE! Thomas opened my package up and thumbed through the book for 30 minutes before he even told me the mail was actually for me. It’s a gorgeous fun-to-read book with amazing new-to-me, tried and true recipes. I’ve already made a handful of them and I can’t wait to share more. 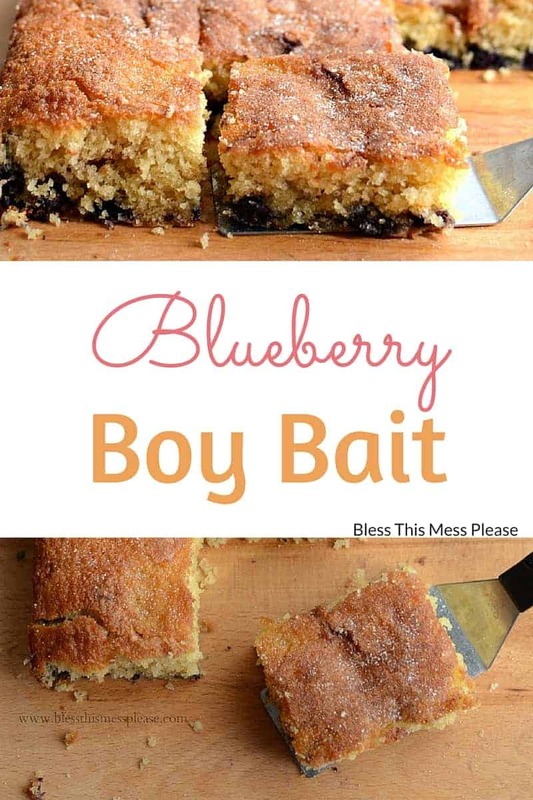 The Blueberry Boy Bait recipe caught my eye because of the fun name, but also because it can be eaten for breakfast, brunch, brinner (breakfast for dinner), or dessert. I love a cake I feel like I can eat all day. I chose to serve it for brinner because cake for dinner makes you the best mom ever. I served it along with my veggie packed Farmhouse Egg Bake and felt great about it. I actually made two egg dishes, one for us and one for my sister-in-law who had just had a baby the day before, and split the Blueberry Boy Bait with them. It was a perfect meal to take to a new mom. The book discusses pros and cons of fresh versus frozen berries and also tells why you need to coat the berries in flour before adding them (so they don’t all sink to the bottom). It also said if using frozen to keep them frozen when using. I made my cake as directed with frozen blueberries and when I went to pop it in the oven I had forgotten to preheat the oven. So while I waited the 10 minutes for oven to preheat, my frozen berries thawed and sunk right to the bottom, just like I didn’t want them to do. So just imagine pretty little berries nicely scattered all throughout the Blueberry Boy Bait. It still tasted good! For the cake, preheat the oven to 350 degrees. Grease and flour a 9 by 13 inch baking pan. In a medium bowl add the flour, baking powder, and salt. Whisk to combine. In a separate bowl add the butter and sugars. Beat with an electric hand mixer or use your stand mixer until light and fluffy, about 2 minutes. Add the eggs, one at a time, beating until just incorporated. Beat in 1/3 of the flour mixture, then half of the milk, another 1/3 of the flour mixture, the rest of the milk, and then the rest of the flour mixture, mixing well after each addition. Toss the blueberries with an additional 1 teaspoon of flour. Fold the blueberries into the batter and then spread the batter into the prepared pan. For the topping, scatter the blueberries over the top of the batter. Stir the sugar and cinnamon together in a small bowl and then sprinkle it over the batter. Bake until a toothpick inserted in the center comes out clean, 45 to 50 minutes. Let the cake cool in the pan for 20 minutes and then turn it out and then place it on a serving platter or cutting board (topping side up). Cut into squares and serve warm or at room temperature. The cake can be stored at room temperature for up to 3 days. Here are a few pictures from the book. The book is divided into regions, which is really fun. The pie is called Thoroughbred Pie (from Kentucky/The Midwest and Great Plains section), and it’s on my list for Thanksgiving. 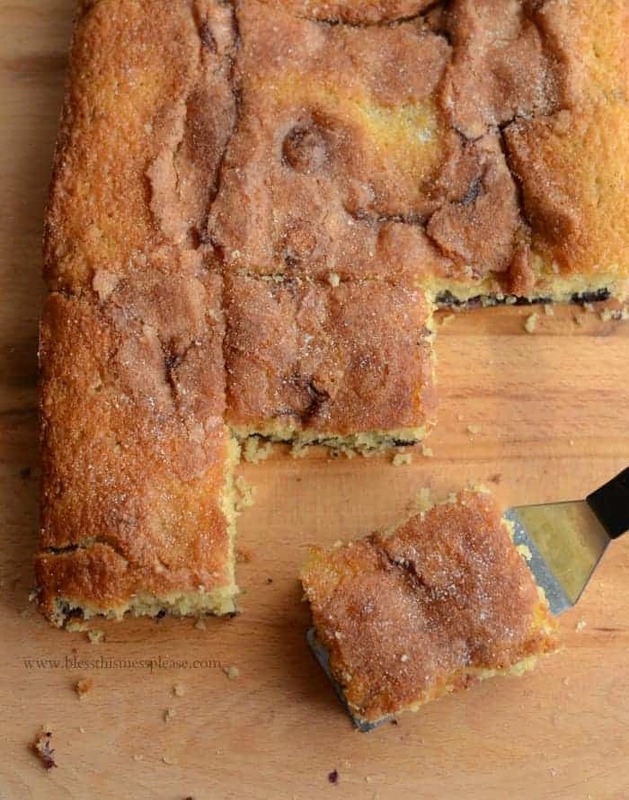 That other slice in the picture is Cracklin’ Cornbread and there’s bacon involved and a cast iron skillet. I can’t wait to try that too. I already made Country-Fried Pork with Gravy and Thomas has requested a repeat for his birthday coming up (the gravy recipe alone would be worth picking the book up for, amazing!). I’m just grateful Utah dodged it’s green jello stigma because what a terrible thing to stick on a state. We eat way more than green jello people (heck, me family eats no jello, that stuff is weird!). I love a good book synopsis. Cook’s Country Eats Local – 150 Regional Recipes You Should Be Making No Matter Where You Live From Maine’s hearty Joe Booker Stew to pineapple-packed Hawaiian Fried Rice, this collection of recipes brings bold local flavors and tried-and-true cooking techniques home—no matter where that may be. Home cooks will discover little-known spe- cialties and revamped classics in each of the four chapters: New England and the Mid-Atlantic, Appalachia and the South, The Midwest and Great Plains, Texas and the West. Colorful local history and anecdotes from Cook’s Country’s tasty travels bring the recipes to life, and illustrated maps and a list of test kitchen–approved hot spots show you where you can try the inspiring original dishes today. Step-by-step photography illustrates key techniques, and full-color photos for every recipe showcase the beauty of the collection. From tailgate staples like Southern Football Sandwiches and Wisconsin Grilled Brats and Beer to old-school sweets like Hollywood’s Tick Tock Orange Sticky Rolls and New York’s Bee Sting Cake, Cook’s Country Eats Local puts an array of flavorful, diverse American dishes within reach—no road trip needed. Thanks for that Amazon, you summed it up well. I’m going to give this book a big two thumbs up and I can’t wait to share more recipes from it with you all! This would make a really fun gift… just sayin’! Thanks for being here and enjoy that cake. Disclosure: America’s Test Kitchen sent me a copy of the cookbook for review but I wasn’t paid for my time, ingredients, or photography. I choose to work with them because I love their products and think you will too. This recipe looks so good and we just froze some blueberries yesterday so we have to try it and serve “brinner” tonight! I love that word! Oh, this is SO getting made tonight! That looks so yummy. So very yummy. Thanks for making me feel like I am not the lone ranger anymore…..I am not the only one who forgets to preheat the oven occasionally. It seems to take forever to warm up too!!! Sometimes I get impatient and throw my item in early. Makes it an even bigger boo boo! 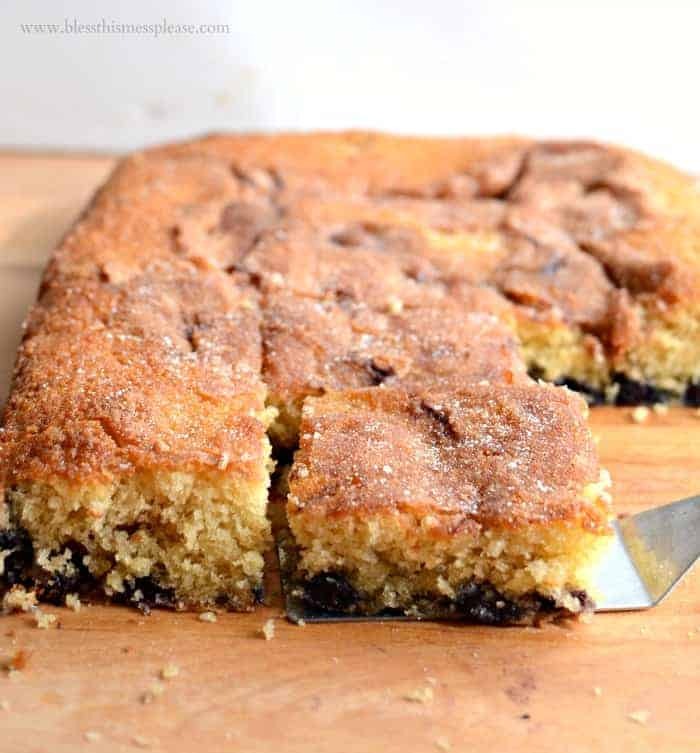 I’ve been looking for a new blueberry cake recipe. This one looks delicious! It must be all the butter because this one was extra good… enjoy! My husband took this to the nursing hime, where I send daily treats. They went crazy over it! One lady even decided she felt like getting out of bed after she had eaten her treat! It was a tremendous hit! That’s so awesome! Thank you so much for coming back to share that with me, I really appreciate that.